I started out early for my yard sale rounds. Now just a tip for you all in case you are ever driving in my town...if I see a sign that looks like this...I brake. Hard. If someone took the time to paint their sign like this...they must have fabulous things, right? When I see a sign like this I get that feeling...a few little butterflies...I drive a little faster than I should...and watch out if you think for a second you are going to pull out of a driveway in front of me. I will go over top of you. Because at the end of it all...I leave with my truck looking like this. I wish I would have taken better photos, but I was in a hurry. I had to unload my loot from Round #1 and head back out for the rest of the sales! There is so much packed in the back of my truck, I could not even label it all. I loaded up 3 times...it was fabulous. And the back seat of the truck?? Well, lets not even go there. It was full. As in c-r-a-z-y full. 32 ornate antique portrait frames, old metal objects, metal baskets and old french books...oh and a few beautiful old linens, too. I have to sort and clean everything up today and start painting those frames! Maybe I will be able to snap more pics tomorrow. Most of this is going to the show with my in May, so if you see something you like..come see me! Happy Monday...and hope everyone had a Happy Easter! Oh my Mary!!! I am still in the process of convincing hubby to make a trip so I can get to some of your beautiful work. I cannot believe what beautiful items you left with!!! Girl you hit the jack-pot! oh my !! I want to see more..
You must have been beside yourself when you finally got everything home! 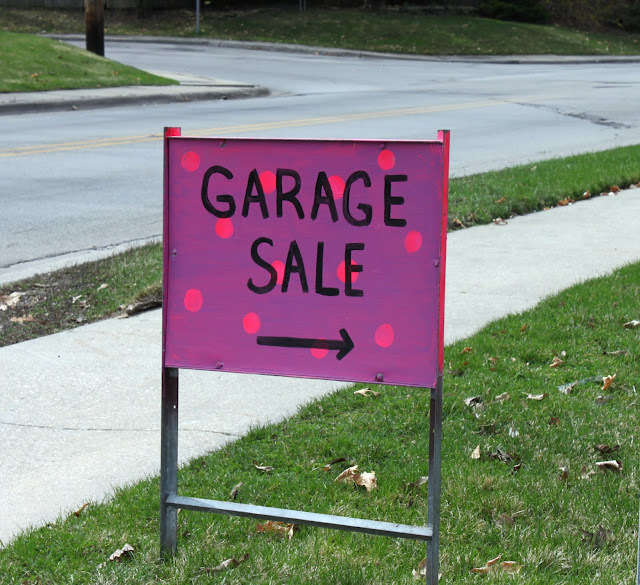 I think I may have to do a road trip to Illinois just to go garage saleing! My grandmother lives there so it could be twice the fun! Oh, wow! This is the reason I need a truck! I would have had to leave most of those fabulous finds behind. girl you are amazing!! haha. bargain shopper! garage sales are the best..i wish i had a truck so i could do that. :) hehe. How I wish I lived out by you so I could come visit you at the show!! Shut up! Shut UP!!!!! 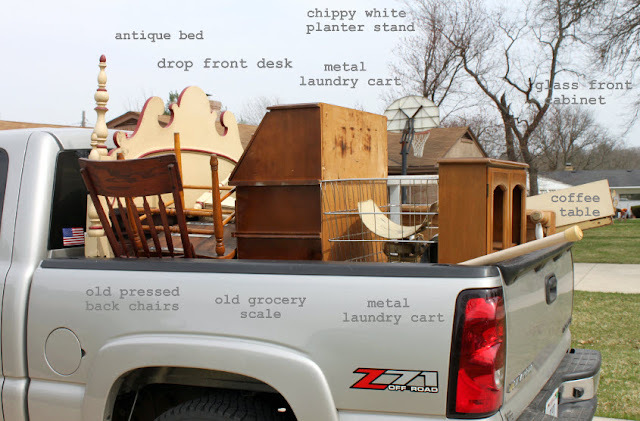 You did not find a metal laundry cart AND a grocery scale AND a drop front desk at a garage sale!!! Hooray for garage sale season!! Woo hoo! I need to get out and about. Maybe this week. I am heading to Grayslake this weekend- first time I will be doing that show. Do you go there? Good to see you Saturday and thanks, as always, for your purchases! Wow...you have a lot of great stuff!! The show is the 1st Saturday in May, right? I SO hope to be there! I'm getting butterflies just reading about it. What a score. And this settles it--I NEED A TRUCK. How fun! Good thing you have a truck! Man, I wish I could have been with you. You did great!! I am on the look out now for pink polka dotted signs. WOW! Garage sales by me don't have stuff THAT good! Really hope to get to the show to see your awesome stuff! Well, would you look at that...you even fit a tree..a basket ball hoop and an entire house in the back of your truck! Oh, I see great things peeking out of that truck....that headboard could be really wonderful. Nice Haul! Amazing finds, you cant beat the rush of a good garage sale I say! Took me a while to pick up my jaw and wipe up the drool.....I have never had that good of luck, so jealous! I judge my vehicles on hauling capacity, my truck's just fine for me but I'd say you're in need of a trailer! Frick! Where in the H E double hockey sticks do you live. Your post was really funny and reminded me of my own insanity when it comes to garage sales. The difference is, I walk away with a tin bucket and you walk away with a moving truck. By the way...what kind of fricken garage sale budget do you have. Hey I am glad you were able to obtain so many treasures just dont come to my neighborhood. Just kidding. Garage sales are such a rush they need to have interventions for people like us. Have fun at your next one and be sure to show us the loot. How do you do it? I would be lucky to find one fabulous treasure after one day. Great finds! I would love a pickup truck!